← Reason #3: He's unhinged. 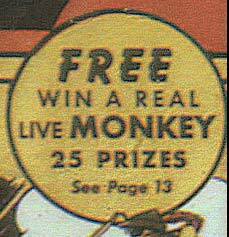 Oh sure, the monkey may be free, but what about shipping, handling, vaccinations, the cage and the bananas? Yeah, THAT’S where they get you! I’d love to hear from those who won back in the day, what the actual prize was, what they went through with it, etc. It’s certainly up there with ads for XRay Specs and guaranteed workout programs as a defining feature of the pulp-comics golden age. I’m sure the parents of the winners were thrilled.